It has been a while since I entered a post. Sadly I am not one of those bloggers who has reached the point of scheduling blog posts. That’s on the “one day” list. For now I live life and stop to blog when I have a moment. Our move is finally over. I really can’t complain-and believe me, I have had to remind myself of that fact repeatedly! I have been privileged to build a home of my dreams, my family’s dreams. It’s not a mansion. In fact, it is slightly smaller than our old home. However, it has a pool and an outdoor fireplace, and well, that is pretty cool. We built the home with our empty nester years in mind. coming all too quickly and I could break out in hives as I write if I ponder it too long, so let’s just move right along! Before our decision to move and build, our family had hit some trials. Not little bumps in the road, but more like white water rapids. The economy plunged a few years back (feel certain none of us needs to be reminded of that fact) and my husband’s business declined. We had to make a decision to end some fairly major financial support of my mother, who struggles with depression and living life as a single woman after 24 years of marriage and living life as a minister’s wife. There was lots of family conflict (not between my husband and I) and emotional turmoil attached to that decision. It’s amazing how much we can suppress and push to the core of our being in an attempt to avoid processing or making the difficult decisions. I also made an attempt at going back to work full time and then part-time, neither of which worked for our family. My husband and I both knew God was calling me to be at home, a calling we had been clear of 14 years earlier. You see, we had fallen prey to some “panic” and worked ourselves into “striving mode”. Neither a faith response to circumstances. I am so thankful in the two years leading up to this move I made the decision to do some internal work, digging deep to see what God wanted to teach me through the trials, the heartache, the situations I could not control. He’s taught me a lot. I let Him, this time ’round. Most of all He has taught me life is lived in the WHITE SPACE-the moments in time when nothing else exists but me and Him. So often I struggle to hear Him, to see Him at work around me, to sense His presence. That’s all on me. One of those things I have to OWN. Once I owned it He began to convict me and speak to me in very real, clear, tangible ways. As a result, WHITE SPACE, has become a really big deal around here. Not only do I seek to implement white space in my daily schedule, literally blocking it off on my calendar, but He prompted me to design my new home with WHITE SPACE in mind. The concept of WHITE SPACE is really a marketing/print media concept. It’s the notion that a page too full, too busy actually distracts the human eye and takes away from the message. The better advertisement or page layout includes critical white space, areas for the reader’s eye to rest, causing one to pause and take in fully the message being conveyed. The same can convey to our schedules, our planner pages, our home decor, our cabinet storage, etc… We need places to rest, to stop, to be able to take it all in. God designed the world using this very idea. He didn’t just ‘BAM” create it all in one moment (and we know full well He could have). He took 6 days. He was deliberate. He was orderly. He rested at the end of each day (WHITE SPACE) and took in the majesty of what He himself had created. On the 7th day, He rested and delighted in it all. He has provided us through His creation “white spaces”-the expanse of the skies, the depths and widths of the oceans, the horizons, … He has given us rhythm to our days-night providing us the WHITE SPACE in which to sleep, rest, rejuvenate; seasons bringing new weather, new plants, new rhythms to our days. How do I live in the WHITE SPACE? 1. I have a little corner of my home created for me. A place I sit each and every morning to ponder His word, journal and pray. 2. I am working to do a better job of protecting Sunday and keeping it a true Sabbath-a day for no work, just worship, rest and play. A day for my family. 3. I attempt to discipline myself in the management of my calendar and our family calendar, leaving literal white space-15-20 minutes between activities, protect dinner time as a WHITE SPACE, build in blocks of time for nothingness to be filled by His prompting. 4. I literally used shades of white as the backdrop for our home. Yes, that is the color of my walls. It is a soft white. 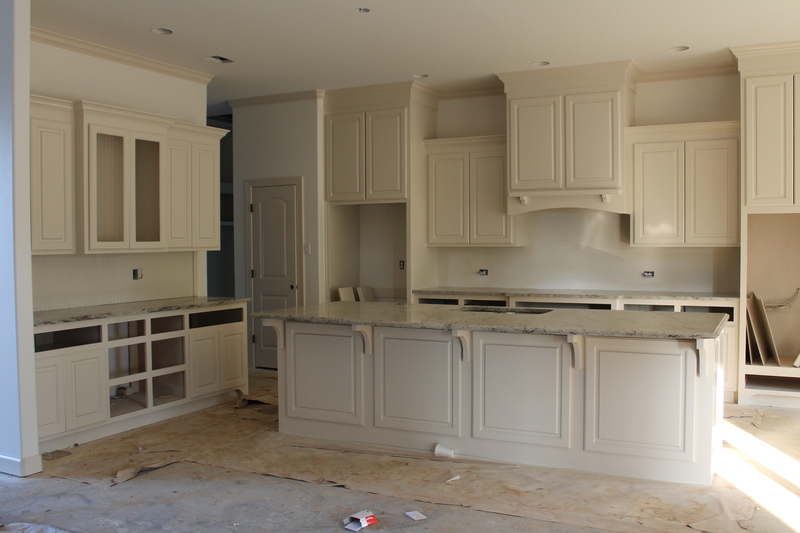 The trim and cabinetry are in the same color family, just 4 shades darker. They are slightly contrasted with the walls. My entire house is all one color. Yep. Hard to believe. The tile, the fixtures etc… all tone on tone. And let me tell you, that is way harder to do than picking vibrant colors. There were many a day I wished I had hired a designer, as I fretted over ensuring this whole tone on tone thing would blend and not look like a mess of white gone awry! 5. We have purged, and purged and then purged some more. A garage sale before the move. Runs to Goodwill after the second move to the second furnished apartment. And upon moving in to our new home, 4 runs to Goodwill. There is something about moving into an open, white on white space that just makes you want to keep it fresh and clean and EMPTY! What have I learned from living in the WHITE SPACE? 1. I am less stressed when I begin my day reading the Bible, sitting in quiet, spending uninterrupted time with God. I have also realized I’ve got a lot of work to do to create some more WHITE SPACE in my brain. The cluttering messages, Satan’s attacks just seem to jump on that time and do everything they can to distract, panic and overcome my peace and joy! 2. I snap less at my family and those I care about most. There is room to breathe in the WHITE SPACE, room to step back and evaluate before reacting. And I am not a good reactor, my tendency is to react negatively :(. 3. Conversations, real conversations, happen when we are not hurried. 4. I am more positive. WHITE SPACE gives me opportunity to see, to really pull back and look at what I have, what just happened, and enjoy it, take pride in it, be glad in it. 5. I am more thankful. Ann Voskamp has taught me much about gratitude. Again, it is about pausing, WHITE SPACE, and naming all that you are grateful for- “One Thousand Gifts”. 7. Color pops off of white. Everything I have looks new! My dark antique wood family pieces look rich and deep next to white walls. The art pops off the walls. The plants (silk and real) look lush and rich in color in front of the white. I notice everything more. And having less makes it all even more noticeable. 8. The desire to keep it pure and simple and white has caused me to really think about what I have and why I have it. Letting go has brought space, room to breathe and that has brought peace. I love my WHITE SPACE. I am so glad I said “yes” to doing something that seemed against my nature, my better judgement, something that was scary. I am so glad I have a physical reminder of what God has been teaching me about my life-my schedule, my thoughts, my planning, my living. Life doesn’t happen in the hectic, hurried moments of trying to run from one event to the next. Life doesn’t happen in the cluttered house, where time is spent managing things. Life doesn’t happen in the car. Life doesn’t happen in activity. No, life is lived best in the WHITE SPACE, where I and those I am with have room to breathe, to rest, to take it all in, to be present. I look forward to sharing with you a room by room glance at our new home and my “new” and improved way of living. I pray it will challenge you, move you to create a little WHITE SPACE of your own.